Above you see our "learning wall" in the kitchen ... you might remember I had my Susan Branch wall calendar here (and a homemade calendar before that), but I found that no one was really looking at those big month-at-a-glances. (Not even me, lol!) There was just too much information to take in at once, I think. So I decided it might be better to focus on one week at a time - as I do with my planner. And I wrote the name of each day with Saturday/Sunday sharing a "weekend" panel. The chalk markers are WONDERFUL. They write smoothly and are quite vivid against the black. I purchased a pack of eight bright colors. Bill was a bit skeptical when I first showed him the panels (in the package) - as he usually is when it comes to hanging things on the wall, lol - but he conceded the end result is neat and pretty. :) And for the record, the chalk wipes off easily and neatly with a damp paper towel. No residue left behind ... Anyhoo, I wanted to share this with you all because I know many of you are organization "junkies" like me. These are worth the money in my opinion! Ok, then - on with the day! A snowy one here (natch) and a busy one, too. I hope yours is a good one, wherever it takes you ... thanks so much for stopping by! p.s. Next post: Answering Helena's question, "What do you mean by "give each day a story?" A gathering of New England wildflowers (tickseed and asters from the yard), Macintosh apples and our Grand Old Flag (in miniature). In the background, a pretty wall hanging that was left to us by our previous home's original owners. An image of my favorite flag style: the Betsy Ross! A very simple, last-minute arrangement, but I love how cozy it all looks. Well, my friends, I'm wishing you all a lovey Friday the Fourth, and a wonderful weekend ahead. Wish it were a little sunnier here today - heavy rains from "Hurricane Arthur" are expected throughout the afternoon. Thankfully we'll be spared any damaging winds ... and there's a beautiful weekend to come, according to those in the know! 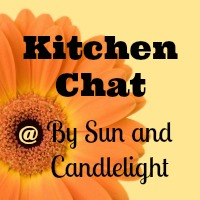 Welcome to another Kitchen Chat! I hope you'll pull up a counter stool and join me for a hot cup of brew and something warm and buttery from the oven - how do blueberry scones sound this morning? This week we're chatting about food storage ... where you keep food and how you keep it, and what you have on hand. Below I have my questions for you all, I hope you'll take a moment to leave your thoughts! I have some visuals to share as well ... with sincere thanks to Elizabeth, Mary and Tanya for sharing their own food storage photos! Name 10 things in your pantry right now. 10 things in your fridge? How about 10 things in your freezer? Please describe the area(s) where you keep food. Are you happy with your current food storage space(s)? What would you change if you could? Do you preserve food in any way - canning or drying, perhaps? Do you ever shop in bulk? And I am quite happy with my food storage space at the moment (we have much more space than we did at the old house), though I would love to add a separate freezer - chest or upright, not sure? - downstairs. We have a set of cabinets in our kitchen which are really well sized for dry good storage. 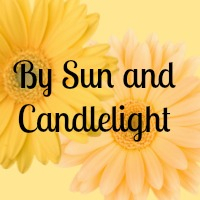 And now for some wonderful thoughts and photos from my dear friends, Elizabeth, Mary and Tanya ... thank you, ladies for taking the time to put your submissions together! "As you can see I don't keep much in the pantry. We eat mostly fresh foods. I keep mostly ingredients on hand for baking and cooking from scratch. The bottom picture is my new refrigerator. Which I love. It has a bottom freezer and double top doors." "For storing food, I use my pantry, and my refrigerators - one in the kitchen, the other in the laundry room. The third and fourth pictures are of my pantry. It's packed! The fourth picture is of the deep side of the pantry that goes rather far back. It's even hard to take a picture! This is where, I will confess, things get lost! ;-) I try using some tiered shelving and wire baskets that pull in and out to help corral the teas, herbs, and spices, but everything else is sort of in an "every man for himself" state of affairs! LOL!! ;-)"
"These show two areas of our kitchen storage that I'm still quite happy with over a year after we moved in. When we started unpacking, I tried to create some stations within my kitchen to make everyday tasks easier and more efficient. The picture on the left is my tea and coffee cupboard. It's situated right above the alcove where the coffee maker and electric kettle are. On the right, the two photos are the top and bottom cupboards of my baking station. The top cupboard holds sugar/baking necessities/chocolate chips etc. The bottom cupboard holds our flours and oils. Gluten free flours on the top shelf and wheat flours on the bottom one. The drawer you can just see above the bottom shelf holds our mixing utensils, measuring cups and spoons. I've really loved having these stations set up in our kitchen ~ I find baking and other tasks so much easier since I have everything I need within reach!" Well, I would be so happy to hear from you on the subject of food storage - if you have thoughts to share and the time to share them, please do so below. (And please feel free to answer one, two or all of the questions!) I think it's such fun to hear about how other people make these household areas work best for them ... to compare notes, challenges and strategies, etc.! So I do hope to hear from you ... but in any account, I will say goodbye for now and wish you all a good day ... take care of yourselves and your loved ones ... and I will see you here again very soon! Kitchen Chat, Week Five: Kitchen Style! I am so excited to share this post with you! This whole series has been fun, but today's post is truly special because I have many contributors helping me out this week. Today we're talking about "kitchen style" and so, first off, I have a bunch of questions for you all ... and then I have my own "take on the topic" ... and finally, I have a whole lot of pictures to share! In as many (or as few!) words as you'd like, please describe your kitchen. What do you like best about your kitchen? If money was no object, how would you change/improve your kitchen? What I like best about my kitchen is the space. I was very fond of my old kitchen but it was a bit small for the amount of cooking I like to do (and the amount of children I have, with whom I love to cook and craft). Our new kitchen has a healthy amount of counter space as well as a lot of storage. Not that it's well organized mind you ... but it will be ... someday! And now it's time for some pictures! I had several kind readers send me pictures of their kitchens ... some folks had one picture to share, some had a few ... and some had lots to say, while others had just a simple reflection. I loved EVERY submission and I am very grateful to all the ladies who took the time to help me out with this project. I'm so pleased this post struck a chord with so many! "The kitchen is truly the heart of the home here so I’m thrilled to be able to share mine. This was taken during dinner prep one night last week. I couldn’t resist the way the sunlight was coming in." "We hold almost all family gatherings at our house becuase we built this kitchen so that many family and friends could gather together. My husband runs a resturant so we are used to cooking for a lot of people. I would say 90% of my family's day is spent in the kitchen area. The kitchen table is to the right (where you see the tip of the chairs) and to the left back of the picture there is a seating area with two couches, t.v., and a fireplace. A view of fireplace and the sitting area and the couches are behind my boys. I LOVE my kitchen! It is warm and cozy. I love cooking, baking, and canning in my kitchen, but most of all I love it when there are many people gathered around eating good food, talking, laughing, and making great family memories!" "Our kitchen is small (not a lot of counter space), and it doesn't have a dishwasher. Those are the things I look forward to having one day! But apart from that, I like my small kitchen. It's painted yellow, and it has a window and screen door (lots of lovely light). And since I don't have a window over my sink, I put up a bulletin board that I love (top right in the photo). It holds my recipes, so it's very practical. But it also allows me to put up photos, Scriptures, quotes, and hymns. We added a small shelf below the bulletin board that holds the remote for my kitchen radio, a candle and a vase for small flowers. My kitchen also has some shelves where I store some of my most-used cookbooks and some other supplies and decorative items. So even though my kitchen is small, it has a very homey feel, which I'm thankful for." "Here are pictures of the kitchen in my new house. Top view is looking out toward the great room and the bottom one is looking toward the breakfast room. I love the extended island my husband had made for me. The counter tops have a touch of pink in them, my favorite color. My mixer is pink. :) My sink is a deep black farm house sink. The appliances are black." "This is one of my favourite rooms in our (relatively) new house and was the thing I loved the most when we moved in last year. Our previous kitchen faced out at the next door neighbour's siding ... not a favourite view! Our new kitchen faces out towards a 1924 house across the road and a large stand of ancient Garry Oak trees. I love it! I also love our kitchen cupboards space and am so pleased at how we were able to set it up when we moved in. The only downside to our kitchen is that lovely large island which so easily gets cluttered up with papers and whatnot." A serene spot in her kitchen .. a sunny windowsill with a St. Francis statue. "A picture of one of my favorite spots in my kitchen ... It is my wing-back reading chair near the fire place. I love to sit here and read and pray and jot down notes and sometimes just plain collapse! ;-) When my son was young he would cuddle up on the chair and cover himself with the quilt while I made breakfast. Also, many a visiting mom has enjoyed nursing a baby here ... including me! The chair has a lot of nice memories. And who knew it when I purchased it so many years ago as a single woman. On the little table next to the chair I keep my various notebooks nearby to make my lists, etc. along with a few books that I am perusing. The table is hand carved and was found by my Mom many years ago on one of our many "junking" adventures. ;-) I remember it in our home as a child." "I put together this little platter for our Bible study group that meets our house on Thursday nights. The hand-dipped straweberries took less than ten minutes from start to finish and that delightful Lindt bunny came out of hiding last night to adorn the platter. He's an Easter gift for our kids." A few favorite spots in her kitchen (which is in England, so naturally I'm especially enthralled!). "A favorite spot in my kitchen. Living in a townhouse, we do not have a huge kitchen but I like it! I have white cabinets, gray granite countertops and black appliances. I needed additional storage so I found this cute hutch at Hobby Lobby. It is filled with my Bachelor Button Louisville Stoneware and topped with my favorite blue and white ceramics that are scattered through out my kitchen. I love pears so my kitchen is "popped" with some bright green touches. I love how it looks with the blue and white ceramics as well as my black appliances. (Bottom photo) My "Purse Bench". I got this little bench and painted it bright green, put it in the hallway from the garage. Now I have a place to put my purse and anything else I am carrying so it does not get dumped on the kitchen cabinets or table!!" "First photo: This is a corner of my counter space, which I have recently found to be much more functional if it has very little on it! I used to have a bread machine out here, and since clearing it and other things off the counters, I have enjoyed the space much more. I have my cookbook stand, a pretty bird tray, and a pottery canister made by my old college roommate in her pottery class - I like to keep it there because it matches the birds on the tray! Second photo: My handy shelf along one wall of the kitchen ... this was here when we moved in, and I found, after years of keeping decorative knick-knacks on it, that it was much better for keeping canisters of grains, seeds, etc. Plus my pottery cup that matches the canister in the previous photo, my catch-all home for writing utensils in the kitchen. And just for a bit of decor, my very first tin of Republic of Tea's Earl Greyer tea, my very favorite type. I have saved this tin since 1998, according to the date on the side, and have gone through several more cans of it over the years! Third photo: This is just a zoomed out shot that shows the location of the wall shelf. I have debated putting hooks on the underside for hanging teacups/mugs, but it may look too cluttered. Maybe I need to lose the corkboards to open it up a bit! Fourth photo: The view through my kitchen sink "window." Most kitchens have a window over the sink that looks into the yard, but mine looks into our sunroom, which was an addition to the house before we moved in. I have my little chicken decorations hanging above it, and in the sunroom, I can see my lisence plate collection hung up as a border along the top of the wall, which makes me happy to look at ... and the sunroom lets lots of light in for a cheerful view! Last photo: This is the same counter space as in the first picture, which makes itself available to keep birthday cupcakes and other such goodies." "The "island" is an old workbench that I rescued from the trash. I cleaned it up and finished it with a protectant to the wood so we could use it in the kitchen. We added casters to the bottom and an old shutter as a shelf so I would have more storage. I use it as a kitchen workspace and we eat at it all the time. Stools are just a Target find. The shelf underneath holds my beloved Kitchen-Aid mixer a few other bits and bobbles. I use an old Coca-Cola crate to store my spices. They are in small glass jars with labels on top. They are actually very handy in that spot! The red hutch is a hutch that was in our home when I was growing up. I painted it red and distressed it a bit. It now holds my collection of white dishes." "Here is our kitchen. We had a small "renovation" last year when our dishwasher leaked and ruined our flooring and cabinets. We had to replace nearly everything but the best part was that we added an island! I didn't think our kitchen was big enough for this, but we we're told it would be fine. And now I don't think I could live without it! The extra storage underneath and the extra countertop space are indispensable for our big family." "Our log house was built entirely by my husband. He cut the trees, milled the wood into "logs" (square) and lumber for the floors, cabinets and trims. It seems the kitchen is the heart of our homes. Mine is no exception. The eating area is just next to the counter. Open concept, with the patio doors opening to the deck. If you lived closer, I would love to invite you for coffee on our deck, watching the sun as it descends. My favorite place. No need for traveling to exotic places ... I already live there." "My husband is an Orthodox priest and we live in a rectory that is attached to the church building and fellowship hall. Our kitchen is very beautiful and far more than we deserve. The property was originally a house and business for a man who ran a tile installation company and his home was his showcase for all of the beautiful tile work that he did. Everything was in pristine order when we moved in two years ago, which was good because the parish had to take on a monumental task of converting a three car garage, office, and bedroom into our sanctuary!" I feel very much at home in my new kitchen ("new" as of last summer). When we first saw it last spring, I liked it immediately, even if at first glance I would not have picked the color scheme for myself. (I have since come to appreciate the soft colors and black accents.) I love spending time in here, which is a good thing considering I find myself here more often than not through the day! Second and third photos show the breakfast nook, another spot where we spend a lot of time. Little Bear's high chair tucks in nicely here and he divides his time looking out the window and watching all the "action" around him. In the lower photo he's having a snack with his Daddy. Final photo, my sturdy little cross with one of my favorite scripture verses ... it sat above my old kitchen sink as well and it brings me peace and energy when I need it. As for next week's topic ... I'm thinking food storage perhaps? Pantry/freezer/fridge ... but more on that later. For now I'm ready to start the morning ... with a hot cup of coffee and a wedge of raspberry crumb cake leftover from Sunday brunch! Good Monday afternoon, my friends! So I have a little idea I thought I'd throw out there and see what you all think. I'd like to start a new series of postings (on Mondays), to bridge the gap between Downton Abbey and Call the Midwife ... how about we talk about a new "kitchen" topic each week? Thanks for taking the time to stop by, everyone ... see you here again very soon! ☀ Welcome to My New Kitchen! After all, I spend a whole lot of time in - and blogging about - my kitchen! At one end of the room there is a large picture window and space for a table and chairs. And oh, I absolutely love this window! That tree in the background - seen in the far right windowpane - is where we plan to post all (or most of) our birdfeeders. Well, we're not sure yet! A cabinet or hutch of some kind ... perhaps for homeschool supplies or table linens/candles/decorations or maybe this will be home to our new nature corner ... we'll just have to see. So there's my new kitchen in a nutshell! I will post more photos later once I get things set up as I'd like ... it's quite a mess right now ... but I can hardly wait to get baking in here! (And for my homekeeping friends ~ well, you can just bet I'm re-tooling my "weekly housekeeping routine" and a post on that will be forthcoming as well. Happy Friday, my friends ~ have yourselves a great weekend! I actually began this post yesterday on "Kitchen Day," and what I mean by that is, on Wednesdays I focus my "housekeeping energy" on the kitchen. This week I put a little extra effort in my cleaning, and it got me thinking about all the steps that are involved in running a family kitchen. I have all these steps listed on my daily chore cards, and though I don't do them all every week, I do have a routine that I stick to as closely as possible. Without it, I'd have a pretty messy kitchen and some pretty hungry kids! So on Wednesdays, I look through the food supply "spaces" (kitchen cabinets, fridge, freezer, pantry) and make note of what needs replacing. I start a shopping list in my small shopping notebook. And some weeks (but certainly not all) I give these spaces a thorough cleaning - vacuuming crumbs and wiping surfaces, allowing them to air dry before replacing (and re-organizing) the contents. Cereal (hot and cold), as well as Earlybird's cocoa rice bars. We keep them up here because he can't reach them and he would eat these all day long if we let him! Crackers, cookies, croutons, peanut butter (Fluff/Nutella/Cookie Butter), applesauce and dried fruts. Once that space was tidied, I turned to the refrigerator ... and goodness, that was a mess! The main section is now pretty much sorted and streamlined, but the stuff on the door is another matter, entirely ... for example, the expiration dates on some of the dressings? Yikes! I got rid of some old stuff and voila, there was light! But those bags of frozen vegetables really need pruning - for a family that doesn't like peas, we sure have a lot of them! So once I've finished cleaning the kitchen, I work a little more in my shopping notebook. I try to look at the pantry/fridge/freezer and see what can be used up and transformed into dinners. I still use my marketing binder for coupon sorting and storage, but I found it a bit bulky for actual marketing. So currently I am using a small spiral-bound notebook for my grocery lists. I clip current coupons (ones that are soon to expire or match up with sales) onto the notebook page itself. The clip marks my place and holds my coupons (keeping them in sight, in mind). And here is one more thing in my kitchen to show you - my little index card file box. I'm not doing much with it currently, but I really like having it close at hand. Inside are multicolored index cards which I use in different ways. I love the idea of the SHE system, but can't seem to commit completely. So that was yesterday's role in the overall kitchen routine. Today (Thursday) I am working on next week's dinner menu. On this day I prepare a new weekly planning folder, and take a look at the calendar - upcoming activities, events, celebrations, etc. Getting a feel for what the next week brings helps me plan dinners accordingly. Also, the sales flyers arrive in today's paper so I can look those over and add things to my shopping list (notes/coupons). My actual shopping trip will take place either tomorrow (Friday) or Saturday morning. I try to go as early as possible in the day, before the crowds and the heat builds. I will do a post about the excursion, along with a little "shop talk" if you will. (Much like my "beauty shop" post, but this time listing preferred grocery items.) So stay tuned for that! So I decided it was time to do a little sorting! Old things went out (and oh my goodness there were some very old things), and overstock got moved downstairs the the big pantry. The rest of the stuff I moved back into the cabinet, as neatly as possible. Now this particular cabinet is situated to the left of our stove and it's what I'd call our "main" cabinet, housing the items we use everyday: coffee and tea supplies, baking goods and pasta-related things. Decorative toppings and chocolate chips, baking soda and powder, cinnamon and other most commonly used spices. The pull-out drawer seen at the very top of this photo holds seasoning packets and decorating supplies like food dye and gels. Whole things like nutmeg, cinnamon sticks, vanilla beans, and star anise, etc. Then, in back of the savory spices I have all the flavored extracts, save vanilla. The vanilla is up front in the lower right shelf - I use it so often I need it quite handy. This shelf also holds our salt/pepper, cocoa, instant coffee (for baking), honey and favorite tinned teas. In the roll-out rack just above, there are two containers of frequently used tea (black, regular). As well as the cooking spray and coffee beans. Extra pasta, sauce-making things, pickling spices and preserves. And to the left, bottled things like Worcestershire, sesame oil, rose water, molasses, minced garlic, etc. And since I was moving all this stuff downstairs, I figured it was a good time to neaten the "big" pantry ... which is really just a hodgepodge of shelving at the bottom of our stairs. On top of these cabinets, I have two open bins - one holds energy bars and hot cereal packets and the other contains an assortment of herb teas. These are easy to reach from the steps and so handy when someone needs to grab a power bar or if I have people over and want to offer a variety of tea. Collected here are also random kitchen appliances like the bread machine, foodsaver, ice cream maker, etc. And for some reason, a folding tray, lol. So there you have it! It's not as organized as it should be, but at least now it's a bit neater! Well, my friends, I hope you're having a good week! Thanks for stopping by today ... I'll be back here again very soon!